Although my oldest son will not even touch a spoonful of hot oatmeal to his lips, the second I change it up and turn this grain into my Cinnamon Raisin Oatmeal Breakfast cake (using certified gluten-free oats), he hastily cleans his plate as if he were a famished child (regardless of the fact that he is anything but). This is such an easy way to make sure the family is getting off to a great start for the day without having to add to that morning rush. The beauty of this recipe is that you mix all of the ingredients together and place them into your baking dish the night before. The only work for you in the morning is to preheat your oven, take your assembled dish out of the refrigerator for a bit (to bring to room temperature), and then bake it for about twenty-five minutes. The texture of this more resembles that of a piece of cake rather than a bowl of oatmeal. My kids say that while this one-dish-breakfast is cooking, the scents wafting from the oven are akin to the likes of the aromas of baking cinnamon rolls. The best part is that my children actually think this is a special treat, even though it is packed with nutrition from the gluten-free rolled oats, the coconut milk, the ground chia seeds, and the farm-fresh eggs. And for those of you that are egg-free – I have a surprise for you. This recipe still works it’s magic when you eliminate those oval gems. The version without eggs actually turned into a brand new recipe that my husband said he likes better than the original. I substitute the eggs for my homemade organic Cinnamon Vanilla Applesauce (though any organic cinnamon applesauce will work just fine) and an extra pinch of baking soda. I substitute the coconut milk for Apple Cider (and eliminate the sugar that is called for in my original recipe). And I trade out the raisins for chopped dried, or fresh, apples. Either way you make it, it is a wonderful way to start a chilly morning. Our family is totally torn over which version is better. My oldest and I like the original version better, while my husband and my youngest love the Apple-themed adaption. The bottom line – whether you make this with or without eggs, this is a recipe that does not seem to be altered by the switching up of the ingredients. 1. In medium bowl, using stand or hand mixer, mix together: Coconut oil and organic palm (or brown) sugar until well blended. Add milk (or apple-cider), eggs (or applesauce), and vanilla. 2. In separate large bowl, sift together: gluten-free oats, sea salt, baking powder, cinnamon, and ground chia (or flax) seed. 3. With mixer on slow speed: gently add in dry mixture and mix for 1 minute until blended. Then fold in raisins (or apples). Then pour mixture into a lightly greased 8×8 baking dish. Cover with plastic wrap and refrigerate overnight. 4. In small bowl mix together topping ingredients and set aside until morning. 5. In morning: preheat oven to 350. Set assembled dish on counter to bring to room temp (about 20 minutes). Sprinkle topping mixture evenly over cake and bake for about 25 minutes, or until feels slightly firm to touch. Serve with vanilla yogurt and top with ground cinnamon, or eat just as is. Hi Cristina! You can totally swap out the gluten free oats for regular rolled oats. Oats, in and of themselves are gluten-free naturally (although some people w/gluten sensitivities can react to them). But what makes them gluten-free is that they are processed in a factory/mill that is certified to not use any gluten-containing grains in their facility at all. Other than that, they are the same as a typical rolled oat. And you can also use regular milk in this as well! Oh my, but this looks yummy. I have always been an oatmeal fan, but my kids are like yours. They won’t touch a bowl of oatmeal, but love it in muffins and cookies. The celiacs in our house don’t seem to react to oats. Yay! Wendy, funny how you can disguise healthy ingredients so easily. I love a bowl of hot oatmeal (I always love mixing in things to mine) so it kills me that my kids do not. This looks great, Kim! I liked eating oatmeal for breakfast – it could probably be my breakfast everyday, actually – with whatever there was, like dried fruit, stewed prunes, etc. We also had a tasty, cold kind of version of oatmeal or muesli from Jamie Oliver called pukkola that had milk (we usually used soy) and dried fruits and sometimes fresh – grated apple was really good with it. We don’t have oats right now – it’s not a thing that’s usually in our house since we switched to SCD, even if we’re not completely following the diet anymore. Though none of us react, I think, some of us do feel that oats can be heavy sometimes and hard to digest. That all said, seeing recipes like this make me want to use oats again in baking. I’m thinking strongly along the lines of an oatmeal chocolate chip cookie! Also, I like some of your blog’s new features like the search bar on the top of the page and that one can highlight any text and look it up or get the definition. That second one reminds me a little of a feature that Answers.com had. Ooh, Zoe that pukkola sounds awesome. I would totally love something like that. If you are thinking about Oatmeal Chocolate chip cookies, you should check out the recipe that Shauna did on her blog. They are fabulous. Beautiful photographs, this looks and sounds delicious! We’re not gluten free in our house as we luckily don’t suffer from any allergies, but I have most of the ingredients so I may have to give this a go. I’m sure my husband and son would love it for breakfast this weekend! Kim! This looks amazing. Is it a little bit crunchy? I think we’ll have to give this a go. As usual, your pic is amazing. And thank you so much for including an egg-free version! I’ll let you know how it goes over when we try it – I know Pete will love it! He can tolerate certified GF oats too! Phew. Okay, I showed Pete the cake and sure enough, he asked me to make it right away! I didn’t need much convincing! It’s in the fridge, waiting for the sun to rise – more likely for my kids to wake me up. I did the egg-free version. I’m a little bit worried about it though! I melted the coconut oil and realized later you might’ve meant for it to be at room temp? Oh well, the result will still taste delish, it just might not look as pretty as yours! I’ll report back tomorrow morning! Hey Maggie, I will be anxious to hear what you thought. I am going to go back and adjust the recipe to say, measured in liquid form. Measuring coconut oil in liquid form versus solid form, yields two different measurements. Here in AZ, it is always very hot (so my coconut oil stays in liquid form), or it is freezing cold (and it ends up totally solid). That should totally fine that you melted it. Should not matter at all. I have also made this with melted butter (warm) and it was just fine. Hope it works out for you!! I really love oatmeal and this looks like it would be fabulous. Always looking for new breakfast recipes. And I so appreciate that it can be made without the eggs. Keeper! Hi Nancy! This is definitely a twist to the regular bowl of oatmeal. Although it feels like a total treat in the morning, it is really super healthy and a good way to start the day. Love the new search bar. It will come in handy when I want to come back for this recipe in a couple of months. I remember oats and cake. I have to wait a couple of months because we are cutting way back on the carbs right now. Sam just feels better, and I need some help with this few pounds that has crept on. But, when it cools down (it will cool down sometime, right?) I think this will be a great breakfast. All of the stuff we love for breakfast rolled into one nice, neat dish. Tia, I so hear you about lowering the carb intake. I always feel better when I go really low-grain or no-grain. I think that is how Kurt lost so much weight. When he first went gf he really just cut most grains out for a while and then slowly added gf ones back in. He was eating mostly just meats, greens, veggies, etc. and lost 20 pounds. My littlej isn’t gluten intolerant, but gets tummy ach from oats, and she looooves them. I am gluten InTolerant, and get tummy ach from them too. The question is…. is it realated or not, that is the question! Hi IntolerantChef! Too bad you and your little one gets tummy aches from oats. Guess this recipe is out. Good thing there are so many other options for oats out there! Quinoa flakes are fun to use in place of them. Although the flavor of quinoa tends to be a bit strong so I usually go a little lighter when using them. And yes, the eternal question….is oat sensitivity related to gluten sensitivites??? To be or not to be. I made pumpkin puree yesterday and plan to make some applesauce tonight, so I think I’ll take this wonderful recipe of yours and play with it. I’m getting inundated with fresh organic apples and sugar pumpkins from my CSA right now. 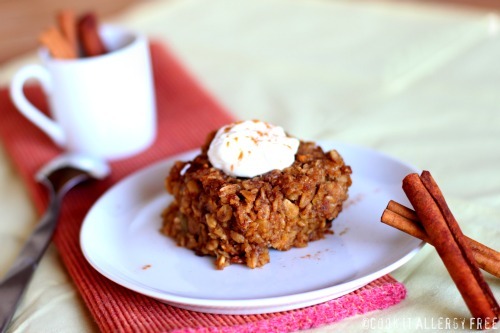 I might have to throw a little pumpkin into this cinnamon raisin oatmeal cake just for fun. I have a bunch of wonderful GF oats from my Montana farmer friends, so your timing is perfect, Kim. I’ve never made an oatmeal cake — you’ve inspired me. Ooh! Melissa, I hope you add some pumpkin to this and let me know how it turns out!! I was going to actually do this when I posted the recipe, but have had quite a few pumpkin recipes on the blog as of late, so i thought I would give my readers a pumpkin break!! 😉 I so love all of the great bounties lately at the farmer’s markets and CSA right now! I wondering if this freezes well. I’m thinking it would be awesome to bake it up and then freeze it in individual portions for those mornings when we just need something quickly. Hi Aileen. This does actually freeze well. I have only frozen it twice, but both times I just cut it into squares, wrapped each square in plastic wrap, then put all of the individually wrapped squares in a freezer bag. Then would just pull one or two servings out at a time. It thawed really really nicely! Perfect for a quick healthy breakfast in the morning. Awesome!! I am definitely going to make this for tomorrow and freeze the leftovers. Do you just microwave it to thaw it then? How long? Beautiful, I love this!! We are not sensitive to GF oats, but unfortunately I haven’t found any here yet – what do you think about trying with millet flakes or quinoa flakes? I realize it’d be a totally different cake, but do you think it might work? It looks so delicious, I’d love to try a version of this! Love that recipe, will be making an egg-free variation soon! I think my oatmeal hating children would love cinnamon raisin cake!! (with oatmeal LOL) I think I will need to try both recipes to see which one we like better. I will still use eggs though for the appley one because, well we have our own chickens and love using their eggs. Thank you so much for sharing this with us at the hearth and soul hop! This looks wonderful! We are fortunate that we can eat gf oats without any problems. 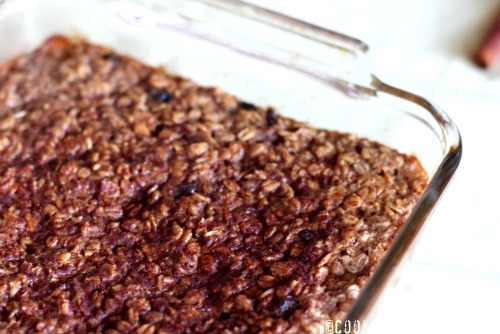 We call this baked oatmeal, and I think it’s time for me to make it again. Yours looks delicious. I think I would go with the egg version just for the protein, but I’m sure the apple version is good too. Hi Linda! Yup. Baked oatmeal is totally another name for this. But calling it cake makes it more exciting for the kiddos!! 😉 And, I like the egg version better myself as well! Yum!! Yes, that’s just like my baked oatmeal recipe! I got it from Lancaster PA at a bed and breakfast! I’ve been playing with it as well and adding flax seeds, raisins, etc… but I also love it just plain! I just found your blog and I’m excited to see so many great recipes. Thanks for giving the egg free options too. It’s difficult to figure out which egg replacer works best when the recipe doesn’t mention it! Has anyone made this into muffins instead of a cake? I am thinking portion control and easy of freezing. Thanks! I can’t use cold pressed oils… suggestions for alternatives? Sounds pretty tasty! I would also be interested in if anyone has tried soaking the oats first.